The National Theater Dona Maria II has facilities for handicapped and deaf people can watch plays or able to visit the building. There are special discounts for disabled citizens.Located in Lisbon, the National Theater D. Maria II, provides accessible facilities and services designed for disabled guests. The Studio Garrett rooms and are fully accessible by elevators and platform lifts. The Noble hall is partially accessible. There are guided tours with accessible route. There is a bathroom for disabled spectators and parking for spectators with special needs.The deaf spectators can watch weekly ,on Sunday afternoons. The sessions with interpretation in Portuguese Sign Language , in career plays. This service is subject to advance booking up to 7 days prior to the session. HistoryIn September 1836, Portugal had just emerged from a civil war. Passos Manuel, then Prime Minister, influenced by the romantic atmosphere that circulated throughout Europe, instructs the polititian and writer Almeida Garrett to create, organize and build a National Theater to contribute to the People’s education .Garrett was also responsible for creating the General Inspection of Theaters and National Conservatory of Dramatic Arts, establish playwriting awards and regulate copyright. A temporary building was chosen, at the street theater of the Condes.Also in 1846, the new National Theatre, would definitely installed at the Estaus palace, former headquarters of the Inquisition. In 1842, began reconstruction work under the guidance of Italian architect Fortunato LodiThe National Theater D. Maria II was inaugurated on April 13th , 1846, the 27th anniversary celebrations of Queen Maria II. 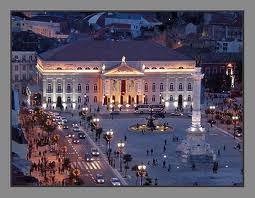 The piece then brought to the stage, was a historical drama in five acts “The Wizard an the 12 of England ” by Jacinto Aguiar Loureiro.With the implementation of the Republic on 5 October 1910, the theater was renamed to National Theatre Almeida Garrett. In 1964 then building suffered a very violent fire, of which only the walls are left. After several years of reconstruction work, reopens to the public in 1978, as we know it today. Volunteer stockThere is a volunteer stock to the National Theatre D. Maria II. One of its missions is to approach the Civil Society. Volunteers can benefit from cultural training and skills development in the area of ​​theater. 4.ª a sáb. 14h às 22h wed. to sat. 2 p.m. to 10 p.m.
3.ª e dom. 14h às 19h tue. and sun. 2 p.m. to 7 p.m.